This past weekend I ran the Gate River Run 15k in Jacksonville, Florida. This is my fifth year running the race and it has quickly become my favorite! It is the largest 15k in the nation and is the national championship race. The almost 20,000 runners include professional runners down to those out there for their first 15k. I love it because it has the feel of a marathon or half marathon with its own expo, but it is very affordable for big race standards. If you sign up early, you can race for only $30. The race course is great too. It starts downtown, runs past the Maxwell House factory, over the Main Street bridge and through a number of different neighborhoods. This is where you see a ton of great fans out on their lawns cheering on the runners. People will have parties in their front yards for the occasion! Might as well, since the roads will be blocked for quite a while. The fans are great. There are always people handing out oranges, ice pops, strawberries, candies, and even beer and sausages! There are also a number of live bands playing along the way. Not to mention all the volunteers that hand out water throughout the course. All of this is leading to the 'Green Monster,' the Hart Bridge. The bridge is a half mile uphill at a 6% incline. Add in the wind of almost 20 mph and this is Not easy! The 1 mile downhill to the finish definitely helps you make up some time, but it is not easy on the knees. Especially for someone like me with reconstructive surgeries done on both knees. At that point though, the faster you can be done, the better! There's plenty of cheering at the bottom of the bridge to carry you to the finish. Plus you can watch yourself finish on the jumbo tron screen at the finish line located right next to the Jacksonville Jaguars stadium. I started off at a pretty good pace, especially considering I'm dealing with a few injuries. I wasn't even sure I was going to be able to run this year. I had an MRI on my hamstring a few weeks ago. I waited for the results to make sure I wouldn't have to have surgery before signing up for the race. No surgery, but I have started physical therapy to help get rid of scar tissue that has built up in there over the last two years. Unfortunately the tightness in my hamstring has led to pain and swelling in my other knee and pain in my heels from plantar fascitis. Needless to say, I probably shouldn't have run this race, but I just couldn't resist. The doctor said I wouldn't be hurting my hamstring further, so I went with that advice. My other issue was the lack of training. It's been harder to get back to my training since having baby #3. My running group doesn't meet anymore since most of them have gone back to teaching full time. Then there's the pain I've been feeling when I run. It's been disheartening. I've always loved races, so I was hoping this would help me get motivated to get back on track. I actually finished much better than I anticipated with a time of 1:22:45 which is a pace of 8:53 per mile. This is quite a bit off of my best, but better than I thought it was going to be. Of course, I'm hobbling a bit when I walk this morning, but it was still worth it! I'm excited to start working to get my times back down to where they were. I've just got to get these injuries healed so that I can do it right. After receiving your finishers medal and some water, runners can head over to the after race festivities across the street. Pick up a free beer, a bagel, bananas, chocolate milk, and a place to rest in the grass! Don't rest too long, because then it's time for the Adidas Junior Kids Run. 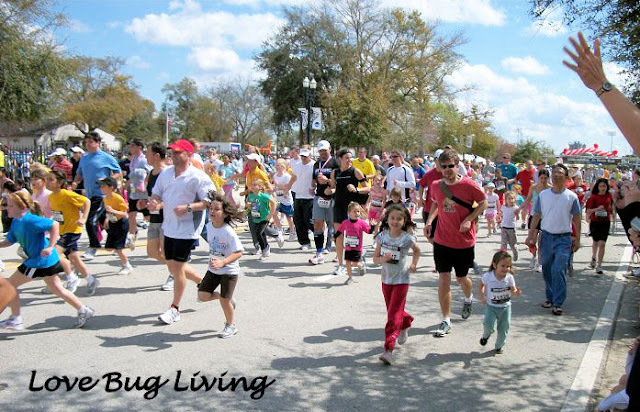 This is a free kids 1 mile fun run. It's great to see so many of them out there to run. 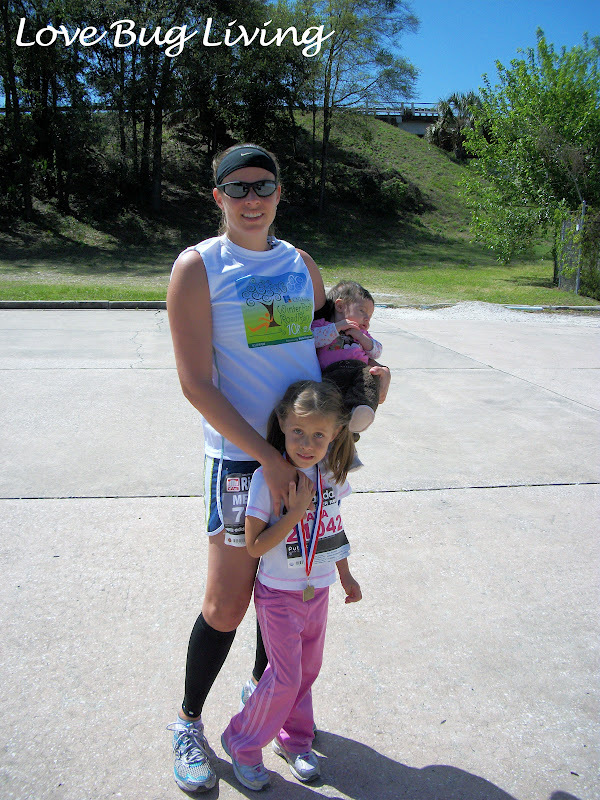 My girls love to run this race! Everyone that finishes receives a finisher's medal and t-shirt. This is a great accomplishment for kids of all ages. Running can sometimes be a lonely sport. Races are a great way to bring in the social aspect of it. If you are just starting to run, signing up for a race is a great way to keep you moving and give you a goal to accomplish. Check with your local running store or on Active for races in your area. The River Run has always been a fun day for my family. I'm already looking forward to next year! Last year's pic since the hubby forgot the camera.